TRA’s goal is to detect and diagnose breast cancer early and quickly. Abnormalities in the breast can be detected by physical examination, mammography, or other imaging studies such as ultrasound and MRI. However, it is not always possible to tell from these imaging tests whether a growth is benign or cancerous. A breast biopsy is performed to remove some cells from a suspicious area through a special probe and examine them under a microscope to determine a diagnosis. Image-guided needle biopsy is not designed to remove the entire lesion, but most of a very small lesion may be removed in the process of biopsy (tissue sampling). The TTH ProMedica Breast Care, the ProMedica metro Toledo centralized breast-imaging hub, offers outpatient breast biopsies using imaging guidance. Biopsies are often done as part of same day work up for findings seen on mammograms, ultrasound or MRI. These biopsies are performed using local anesthetic (lidocaine) and small tissue acquiring “vacuum assisted” probes. You will be awake during your biopsy and should have little or no discomfort. Most women report the procedure to be “easier to tolerate than anticipated”. Outpatient biopsies provide an accurate and less expensive alternative to surgery with little distortion or scarring. When you receive the local anesthetic to numb the skin, you will feel a slight pinch from a needle. You may feel some pressure when the biopsy probe is inserted. The area will become numb within a short time. You must remain still while the biopsy is performed. As tissue samples are taken, you may hear clicks from the sampling instrument and feel pressure. The BBC nurse will review post biopsy instructions following your procedure. Stereotactic breast biopsy is performed when an abnormality is seen best by digital mammography. A special computerized mammogram table is used to pinpoint the exact location of the breast abnormality taken from two different angles. The radiologist guides the special probe through a small skin nick and advances it to the target. This procedure is performed with the patient on her stomach and the breast in light compression. Ultrasound guided breast biopsy is indicated when an abnormality can be seen by ultrasound (may or may not be visible on the mammogram). 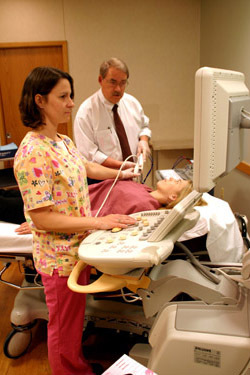 The high frequency ultrasound machines can provide very accurate guidance in placing the biopsy probe. This procedure is performed with the patient lying on her back or side and does not require breast compression. We also use ultrasound to guide cyst aspirations. MRI guided breast biopsy is warranted when an abnormality can only be seen by MRI (not visible by mammogram or ultrasound). The dedicated Aurora Breast MRI machine features a cutting edge biopsy system to facilitate the procedure. 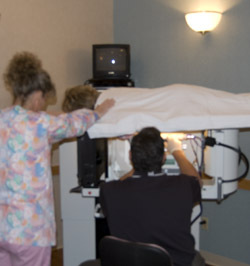 As with the routine breast MRI examination, the biopsy is performed with the patient on her stomach. The MRI biopsy is shorter than the routine MRI scan but does require light breast compression. All breast biopsy tissue is sent to the ProMedica pathology laboratories for analysis. It usually takes 2-3 days for pathology to arrive at a diagnosis.